The Sagrestia Nuova was intended by Cardinal Giulio de' Medici and his cousin Pope Leo X as a mausoleum or mortuary chapel for members of the Medici family. It balances Brunelleschi's Sagrestia Vecchia, the "Old Sacristy" nestled between the left transept of San Lorenzo, with which it consciously competes, and shares its format of a cubical space surmounted by a dome, of gray pietra serena and whitewashed walls. 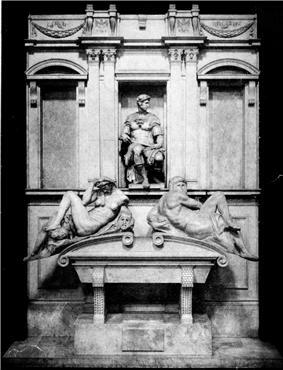 It was the first essay in architecture (1521–24) of Michelangelo, who also designed its monuments dedicated to certain members of the Medici family, with sculptural figures of the four times of day that were destined to influence sculptural figures reclining on architraves for many generations to come. The Sagrestia Nuova was entered by a discreet entrance in a corner of San Lorenzo's right transept, now closed. Though it was vaulted over by 1524, the ambitious projects of its sculpture and the intervention of events, such as the temporary exile of the Medici (1527), the death of Bartolomeo Ammannati finished the work by 1555. There were intended to be four Medici tombs, but those of Lorenzo the Magnificent and his brother Giuliano (modestly buried beneath the altar at the entrance wall) were never begun. The result is that the two magnificent existing tombs are those of comparatively insignificant Medici: Lorenzo di Piero, Duke of Urbino and Giuliano di Lorenzo, Duke of Nemours. Their architectural components are similar; their sculptures offer contrast. On an unfinished wall, Michelangelo's Madonna and Child flanked by the Medici patron saints Cosmas and Damian, executed by Giovanni Angelo Montorsoli and Raffaello da Montelupo respectively, to Michelangelo's models, are set over their plain rectangular tomb. A concealed corridor with drawings on the walls by Michelangelo was discovered under the New Sacristy in 1976. The octagonal Cappella dei Principi surmounted by a tall dome, 59 m. high, is the distinguishing feature of San Lorenzo when seen from a distance. It is on the same axis as the nave and chancel to which it provides the equivalent of an apsidal chapel. Its entrance is from the exterior, in Piazza Madonna degli Aldobrandini, and through the low vaulted crypt planned by Bernardo Buontalenti before plans for the chapel above were made. The opulent Cappella dei Principi, an idea formulated by Cosimo I, was put into effect by Ferdinand I de' Medici. It was designed by Matteo Nigetti, following some sketches tendered to an informal competition of 1602 by Don Giovanni de' Medici, the natural son of Cosimo I, Grand Duke of Tuscany, which were altered in the execution by the aged Buontalenti. A true expression of court art, it was the result of collaboration among designers and patrons. For the execution of its astonishing revetment of marbles inlaid with colored marbles and semi-precious stone, the Grand Ducal hardstone workshop, the Opificio delle Pietre Dure was established. The art of commessi, as it was called in Florence, assembled jig-sawn fragments of specimen stones to form the designs of the revetment that entirely cover the walls. The result was disapproved of by 18th and 19th century visitors, but has come to be appreciated for an example of the taste of its time. 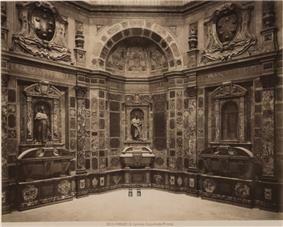 Six grand sarcophagi are empty; the Medici remains are interred in the crypt below. In sixteen compartments of the dado are coats-of-arms of Tuscan cities under Medici control. 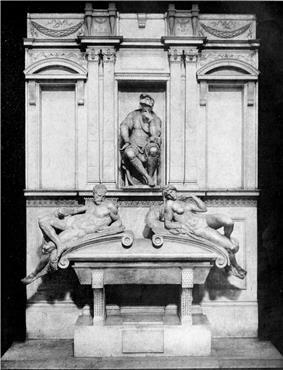 In the niches that were intended to hold portrait sculptures of Medici, two (Ferdinando I and Cosimo II) were executed by Pietro Tacca (1626–42). ^ Modern entrance, which requires a ticket, is through the Cappella dei Principi. ^ Avery, Charles (1970). Florentine Renaissance Sculpture. John Murray Publishing. p. 190. ^ Antonio Paolucci. The Museum of the Medici Chapels and the Church of San Lorenzo. Sillabe Publishing 1999. ^ The doctor-saints (medici) hold their doctor's boxes of salves and nostrums. ^ A sequence of small spaces leads from the Sagrestia Nuova also. 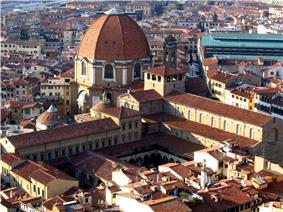 ^ In the separate, earlier crypt beneath the nave of the basilica itself are buried Cosimo de' Medici and Donatello. ^ Touring Club Italiano, Firenze e dintorni (Milan, 1964) p. 285f. ^ TCI, Firenze e dintorni 1964:286: "indeed, conceived according to the Baroque aim of arousing stupefaction" (concepita già secondo il fine barocco di destare stupore).